Enrique Pena Nieto, Mexico’s new president, has been inaugurated amid tight security in the capital Mexico City. He wants to boost economic growth and cut drug-related violence, but analysts say it is not clear how he will do so. Some 60,000 people have been killed in drug-related violence during the rule of his predecessor, Felipe Calderon. As Enrique Pena Nieto’s motorcade approached Congress, petrol bomb-wielding protesters clashed with riot police who fired tear gas outside the building. The demonstrators are angry at what they say was vote-buying by the president’s campaign. They were also protesting more generally against the return to power of Enrique Pena Nieto’s Institutional Revolutionary Party (PRI) after a 12-year absence. 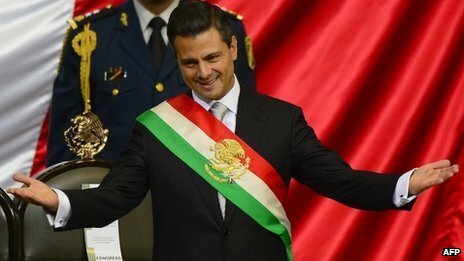 Amid a cacophonic trumpet fanfare, outgoing President Felipe Calderon handed a sash with the colors of the Mexican flag to Enrique Pena Nieto, who was expected to address the nation from the presidential palace later on Saturday. All week in Mexico City, a ring of steel had been in place around the Congress building ahead of the ceremonial presidential inauguration. His foreign minister will be Jose Antonio Meade, who was treasury minister in Felipe Calderon’s outgoing government. Enrique Pena Nieto spent his final days as president-elect in talks with leaders in the US and Canada, Mexico’s partners in the regional trade organisation, Nafta. But during his election campaign Enrique Pena Nieto was adamant the party had evolved. “I can say categorically that in my government, there won’t be any form of pact or agreement with organized crime,” he said. Earlier this month, he denied the PRI’s return to power would be a return to the past. “It is not, because this is a different country,” he said. Enrique Pena Nieto has indicated he will focus on tackling extortion, kidnapping and murder, and he has drafted in support from Colombia’s former top policeman. But for many Mexicans, Felipe Calderon’s legacy as president is of an estimated 10,000 drug-related killings a year for the past six years.